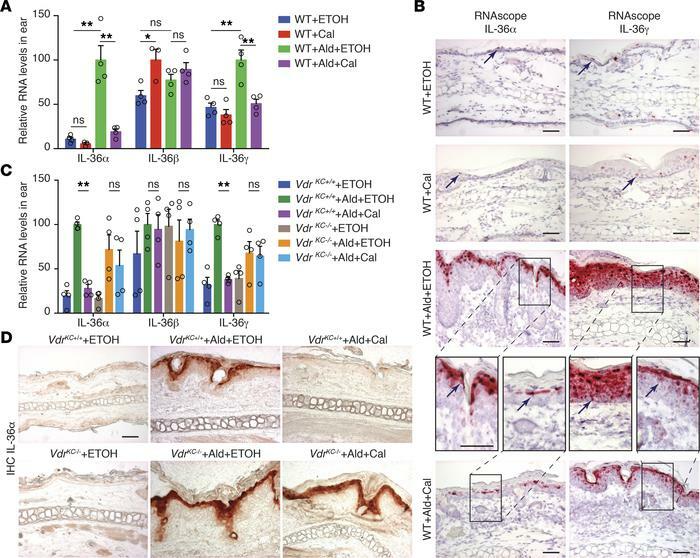 Calcipotriol inhibits IL-36α/γ expression in mouse psoriatic skin epidermis in a keratinocytic VDR-dependent manner. (A) qPCR analyses for IL-36 in Balb/c WT ears treated with ETOH, Cal, Ald+ETOH, or Ald+Cal (as described in Figure 1A). *P < 0.05; **P < 0.01 (2-tailed Student’s t test). Values are mean ± SEM. (B) RNAscope in situ hybridization with IL-36α or IL-36γ probe (signals are in red) on mouse ear sections, counterstained with hematoxylin. Scale bar: 50 μm. (C) qPCR analyses for IL-36 in VdrKC–/– mice (K14-CreTg/0/VdrL2/L2) and their littermate VdrKC+/+ controls (K14-Cre0/0/VdrL2/L2), treated with ETOH, Ald+ETOH, or Ald+Cal. Values are mean ± SEM. **P < 0.01 (2-tailed Student’s t test). (D) IHC staining with IL-36α antibody on ear sections. Positive cells are in dark red. Scale bar: 50 μm. Data are representative of 3 independent experiments with similar results.